Warrior Shield Cufflinks, They are sterling silver with 18ct yellow gold beading. 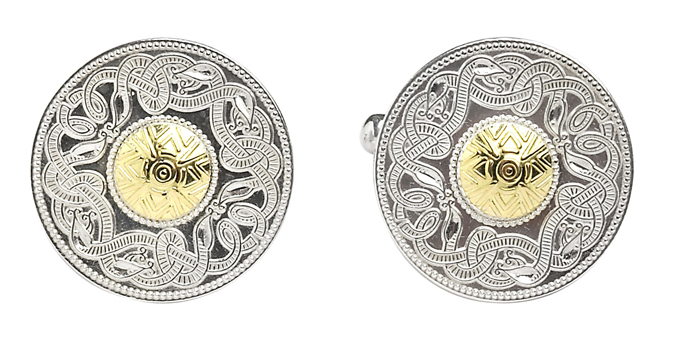 These stunning cufflinks show the ancient warrior shield design. They are sterling silver with 18ct yellow gold beading. This gorgeous traditional design dates back thousands of centuries, incorporating both the Celtic shield and the Celtic animal design. Please feel free to call or email one of our friendly staff members anytime for further information and personalised service. ID105 Warrior Shield- Mens,This stunning ring incorporates a design that is thousands of years old. 14ct Yellow gold weave, white gold trim. ID109 Warrior Shield - Ladies,This claddagh is a heavy weight "Puffed heart" version of the ring. This stunning bangle show the ancient warrior shield design. It is sterling silver with 18ct yellow gold beading. Heavy Traditional Claddagh RingThe hands represent Friendship, the heart Love, and the crown Loyalty.